1901	Kay		36E0040N3250001	  American Br. 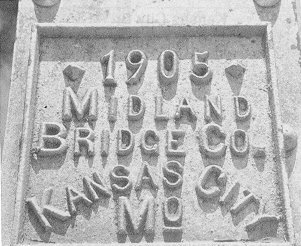 1902	Kay		36E3140N0180001	  Kansas City Br. 1902	Kay		36E0110N3200005	  Canton Br. 1907	Noble		52N3260E0390003	  Midland Br. 1907	Pawnee		59N3500E0370006	  Canton Br. 1909	Osage		57E0320N3830008	  Missouri Valley Br. 1909	Wagoneer	73N4155E0640001	  Central States Br. c1910	Kay		36E0220N3240009	  Canton Br. 1910	Rogers		66E0300N4270001	  Missouri Valley Br. 1912	Lincoln		41N3510E0840006	  Kansas City Br. 1914	Creek		19E0870N3610005	  Toledo Massillon Br. 1915	Washington	74N4010E0030002	  Rochester Br. 1915	Washington	74N4030E0350006	  Rochester Br. 1915	Washington	74E0100N4030002	  Rochester Br. 1929	Okmulgee	56E0870N3870007	  Vincennes Br. 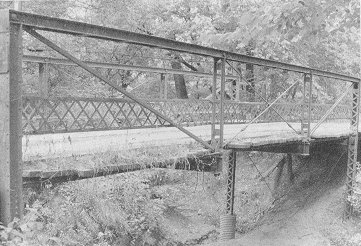 Termed a truss leg pony because of its perpendicular endposts that made the structure virtually self-supporting, the Pratt bedstead found considerable favor within Oklahoma counties improving rural roads early in this century. 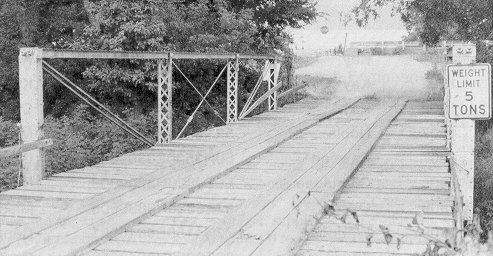 Some of the first documented trusses erected in the state, principally those remaining in Kay County (Figure 44) are of this type. A simple variation from the ordinary Pratt pony meant that most companies active in Oklahoma could provide truss leg bedsteads. 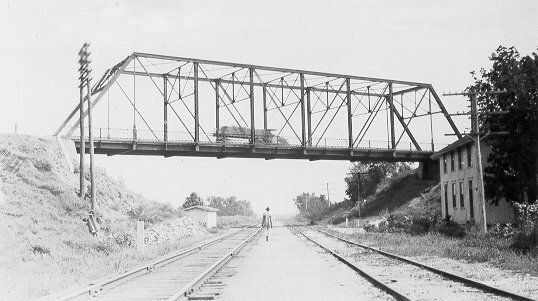 The structures that remain today offer a good sample of builders, including leaders such as the Canton Bridge Company and the Midland Bridge Company of Kansas City (Figure 45). Important nationally, though less active in this state, Toledo Massillon from Ohio, and the Central States Bridge Company of Indianapolis built bedsteads in Oklahoma (Figure 46). County commissioners found the bedstead appealing for its self-supporting characteristic, saving them from making a costly substructure. With this type the abutment could be simplified to the point where it was merely a timber or metal plate to form a connection with the bank and reduce sloughing. Oklahoma bedsteads generally had the vertical supports made of angles riveted together by lacing bars, rolled steel channel for the upper chord and eyebars for the bottom chord. A standard diagonal consists of eyebar, and the counter was formed from cylindrical eyebar. A few bridges have distinctive features. The Canton company on occasion attached its diagonals to the top chord with two exposed nuts (Figure 47). 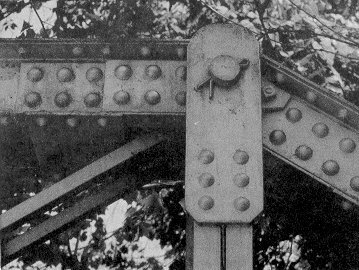 A 1902 Kansas City Bridge Company bedstead in Kay County utilized cotter pins to fasten the joint pins (Figure 48). Making an interesting exception to the reputation of the Missouri Valley Bridge Company as a builder of big through trusses, in a bedstead built in 1910 north of Chelsa in Rogers County. The same characteristics that helped sell the bedstead to the counties, however, could also become weaknesses. They were vulnerable to floods or became rickety and unsafe if not strengthened with bracing or their legs set in concrete or rock-filled tubes. Figure 44. Bridge 36E0110N3200005 is a 1902 bedstead built by the Canton Bridge Company fir use in a creek near Blackwell in Kay County. A trademark of the Canton was the large hexagonal nuts securring the diagonals at the endpost. Figure 45. Midland Bridge Company was a leader in supplying Oklahoma counties with small, standard trusses. Figure 47. 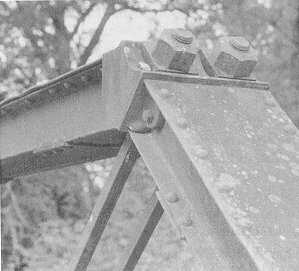 The nut fastenings on Bridge 59N3500E0370006, a Pratt half-hip near Hallett suggests construction by the Canton Bridge Company, but sure documentation is lacking.